Open from 9.00 to 21.00 daily. Last entrance is at 20.00. We are comparing Gaudi Casa Batllo Tour Ticket with Video/Audio Guide Prices from leading ticket suppliers and Try to find you Cheap tickets prices on the market. A world away from the Basilica de la Sagrada Familia, La Casa Batllo, which was took Gaudi 2 years to design, is one of the leading pieces in the Modernisme Architectural Movement, and a visit to this unique building is a must for all aspiring architects and art enthusiasts. This converted 19th century property displays Catalan influences and key features of the Art Nouveau period. Entering the building you'll first notice the incredible use of light and colour which draw you further into to the 5,000 square meter complex. On each level and in each room, you will find different provoking motifs, created using a combination of wood, ceramic, stone, glass, and of course, colour. With the Casa Batllo being such a prominent landmark in Barcelona queues to enter are often very time consuming. Fortunately, this fantastic combined ticket will allow you to skip the line and go directly to the entrance hall where you will pick up your multilingual video guide. Once inside you can explore the site at your own pace, the video guide will direct you through the Casa Batllo's 5 section. Hear about the building and its creator as you walk, and don't forget to pay a visit to the stunning roof-top terrace before you leave. The Casa Batllo is a must see for art-lovers and architects, this is one of the most revered works of the Modernisme Movement, the complimentary video guide will provide detailed information on the history and significance of Casa Batllo. Your Experience With Gaudi Casa Batllo Tour Ticket with Video/Audio Guide? Visit a whimsical UNESCO World Heritage Site right in the heart of Barcelona and see one of the greatest architectural achievements of the Modernisme Movement, La Casa Batllo. Marvel at the bright colours, light and carved tiles of this fantasy world which Antoni Gaudi created. Explore the former home of the Batllo family and visit the rooftop terrace for charming city views. Learn about this unique building with an engaging multilingual video guide. Enjoy skip the line entrance and a reasonably priced combo ticket including fast track entrance and video guide. What Gaudi Casa Batllo Tour Ticket with Video/Audio Guide Includes? Skip the Line entry to La Casa Batllo. Audio/video guide in several languages including; English, Spanish, French, Italian, Portuguese, German, Russian, Japanese, Korean, Chinese and Catalan. Travelers Reviews about Gaudi Casa Batllo Tour Ticket with Video/Audio Guide? This tour has 4.8- out of 5-stars from Get Your Guide users. The tour also has a solid 5-star rating on TripAdvisor which is partnered with Viator. Travellers agree that fast track entry will save you a lot of time. Reviews say that the Casa Batllo is very interesting and a great place to see. 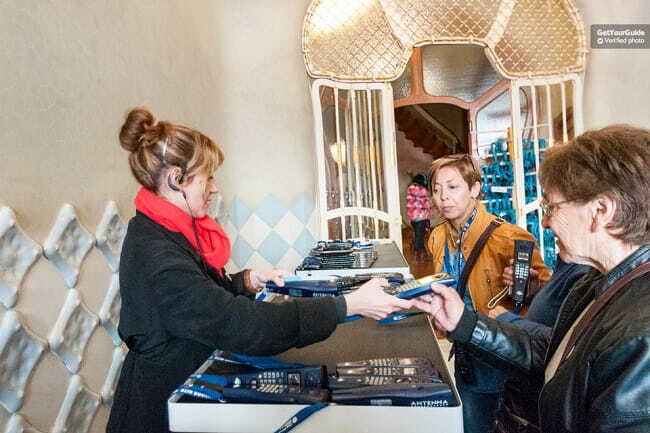 Tickets are accepted at the entrance to Casa Batllo in either printed or electronic form. Discounts: ages 0-6 go free, ages 7-17, students (with valid ID), or seniors (65+) receive discounted entry tickets. Cancellation policies will depend on individual suppliers, please check when making the booking. Most tickets are refundable however fees may apply for cancellations made less than 7 days in advance. The building is wheelchair friendly but it is recommended that disabled visitors come with an assistant. On certain occasions events are held in the Casa Batllo, on these days the museum will close at 14.00. Entrance: Please use the entrance marked ‘Vouchers and Groups', Casa Batllo, Passeig de Gracia 43, Central Barcelona.